Less than 50 km from Chania between Topolia and Koutsamatados is an interesting cave known as Agia Sofia and Wisdom of God. 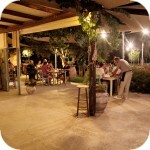 It is located on the main road connecting Elafonissi beach and Kissamos village. This road leads along the spectacular Gorge Topolia. This is one of those roads on Crete that are not forgotten. On one side of the road there is a high and steep rock, on the other hand a chasm leading to the bottom of a 300 meter gorge. In addition, a narrow tunnel was designated on this route, to which entry is only possible in a shuttle. Coming from the Elafonissi beach, the Agia Sofia cave is just before this tunnel. It is located at a height of about 400 meters, so when we look at it from the bottom, we see only a not too big entrance opening. There is also a small belfry and a metallic star that reflects on sunny days. Leave the car on the road at the Panorama Café tavern, where the path leading to the entrance to the cave begins. Climbing up a steep rocky slope is marked by stone stairs climbing up sharply. We visited this place in the spring afternoon, when the cave is in the shade. It definitely made our climb easier. Despite the fact that the cave did not give us a large impression at the bottom, we changed our mind during the approach. It is inhabited by dozens of pigeons, whose multiplication coincident by the echo, intensifies the growing anxiety during approach. When we reached the top it turned out that the cave Agia Sofia is quite large and high. Its area is about 70 m in diameter, and the height reaches even 20 meters. Our surprise caused that in the cave on the left there is a small chapel of the same name. Although its decoration is modest and very typical of Orthodox sacral objects, its location has made us feel that extraordinary presence. After years of learning about Crete, we are not surprised by the fact that chapels and churches are located under rocks, in various hollows. However, in Agia Sofia there is something unusual, one could say that it is a cave of God. The name of the cave and the chapel of Agia Sofia comes from the icon that is located here. Probably it comes from a temple formerly located in Constantinople. According to the legend, the Cretan seamen defended the city's shores against attacks by the Turks. When Sultan Mehmed II announced a truce, he allowed them to sail home. They could not take a gun with them, but in exchange they got permission to take something in return. A part of the Cretans from Kissamos, she took the icon with her and hid it in this cave. Later, a chapel was built here. After seeing a sacral part of the church, we started exploring the cave itself. There are a lot of stalactites and stalagmites in its area, the size of which reaches even about 6 meters. This is where the pigeons are in operation, which are constantly making noise and flying. There is a lot of humidity in the cave, so the rocks cover moss in many places. According to the sources, Agia Sofia was once a place of worship, and many artifacts from the Neolithic times were found in its area. They were mainly clay figurines and ceramic vessels. On one of the larger stones is a strange shape reminiscent of a horse shoe. According to some sources, it is the imprint of the horse's hoof. George. This cave has not been fully researched, so there are suspicions that it extends into neighboring small caves and rooms. Some time ago, two skeletons without heads dating back several centuries were found in the cave. It is believed that these were the remains of the Psaromilingos brothers who were hiding in the cave during the Venetian occupation. They were to die in a fight during the rebellion led by Leon Kallergis, who did not agree to an amicable policy towards the occupant. The heads of the brothers delivered to the Venetians were to save the lives of other insurgents. Today, two holidays are celebrated each year at Agia Sofia: on Tuesday after Easter and on December 24. Entrance to the cave is possible every daybetween 8-20. Admission is free so far. I tez widzialam, nawet dwa razy. Jak będę na Krecie to zawsze tam wstapię. Παρολίγον να μη γνωρίσω το μέρος, έχω φωτογραφίες εκει. This ancient quarry, consisting of two parts by modern times, is called Λαβυρινθάκι and Λαβύρινθος. According to some scientists, it was here in Knossos that there was a mythical labyrinth of King Minos. According to Greek mythology, Zeus hid (and perhaps even gave birth) in the Ida cave. This myth is the greatest asset of this cave, which is not as interesting and beautiful as the Dikte cave. Ida Cave is just an empty and unlit big hole in the rock. Quite steep descent to the bottom is built of old railway sleepers. At the bottom of the cave there is a wooden platform, there are also remnants of the former excavations. The cave is located on the eastern slope of the Psiloriti, in the central part of Crete - about 20 kilometers from the village of Anogia. Its total area is approximately 800 square meters. It consists of four chambers, of which the largest, main chamber is about 40 meters long and 50 wide.